Taste test: These thin-cut potato chips were crisp with a mild but tasty seasoning. It was kind of like a barbecue taste, but without any real heat or sweetness. Smell test: Sort of like paprika. OK. 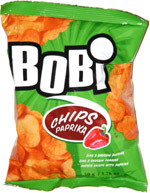 This snack was discovered by Amitai in Budapest. Review published .